Joke Perd Mho Paradise is a franchise chain that is famous for its tom yum porridge. 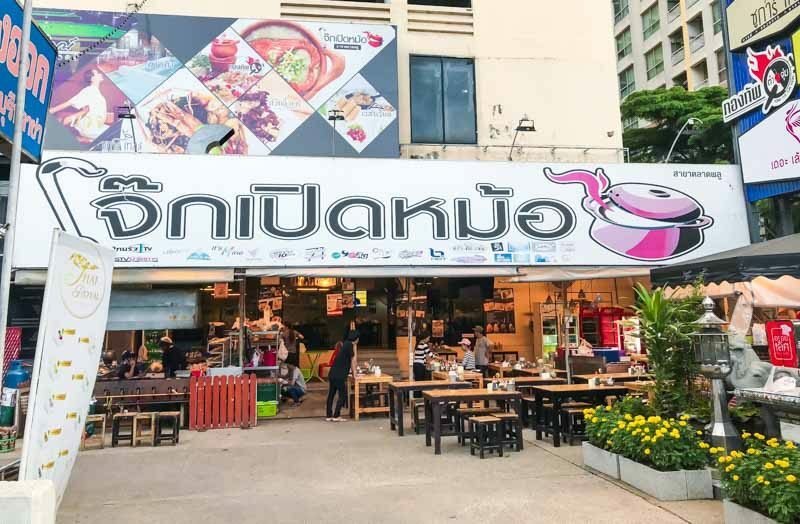 The franchise is currently at 25 locations in Bangkok and other parts of Thailand. ‘Joke’ is Thai for porridge or congee, while ‘Perd’ means ‘to open’, and ‘Mho’ means pot. 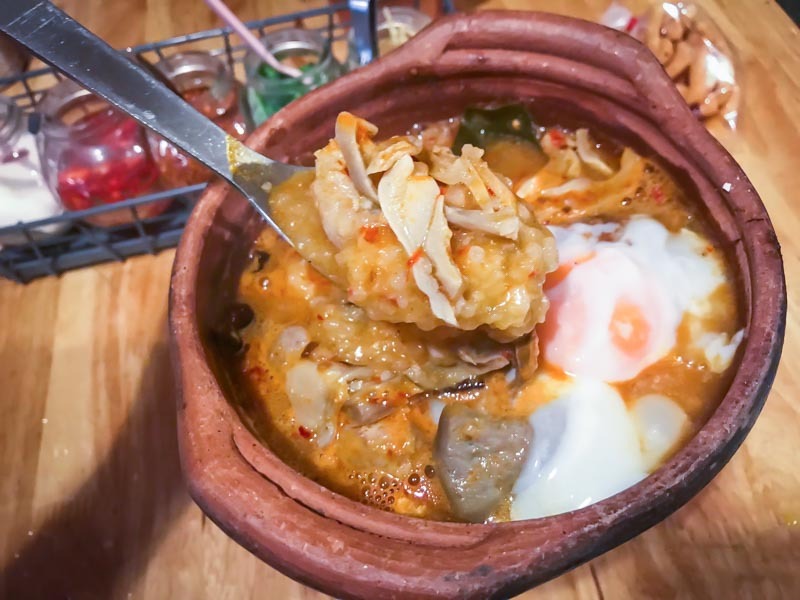 What this shop specialises in is Thai porridge served piping hot in a clay pot. At first glance, the way this porridge is served is extremely visually appealing and we could not wait to dig in! 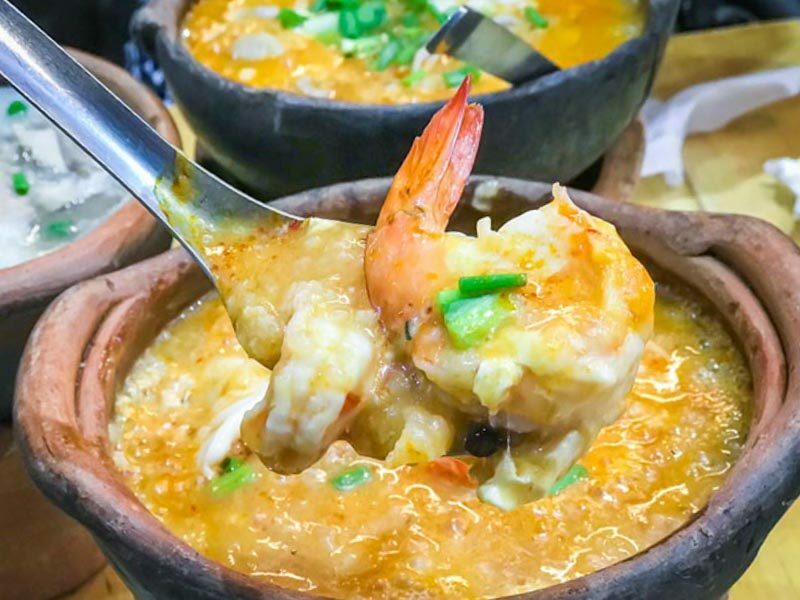 Apart from the porridge, this restaurant serves many kinds of barbecued seafood and meats. However, the main focus is the porridge and in particular the tom yum version of it. 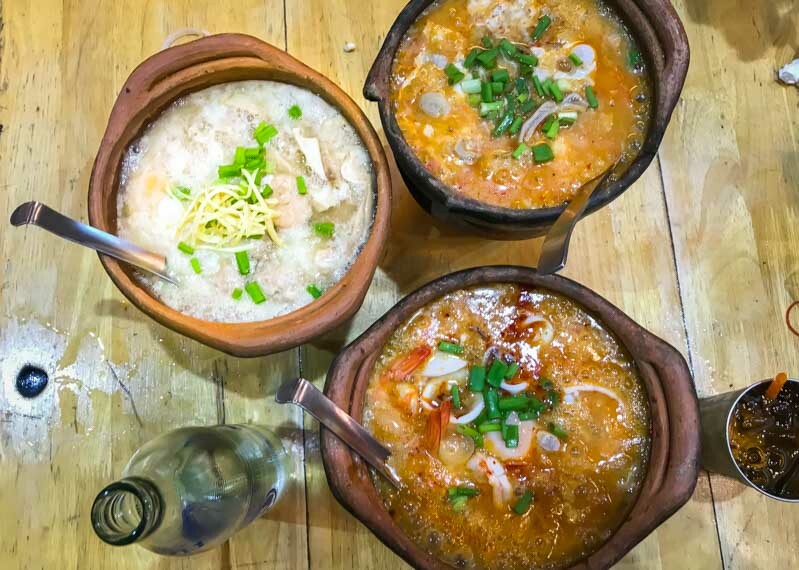 There are basically three kinds of porridge: Plain, Tom Yum and Spicy & Sour. 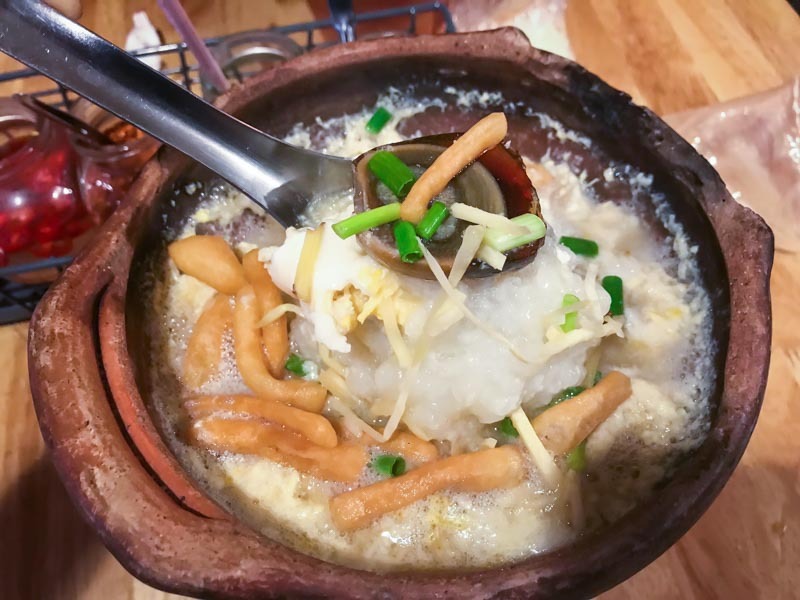 For either, you can choose from a variety of ingredients — seafood, mixed eggs (boiled, salted, century), stewed pork, mixed pork (pork ball, intestine, liver, stomach, minced pork), mixed mushroom (enoki, king oyster, straw, shiitake), and vegetables. Thais love to have their porridge with Pa Tong Go. 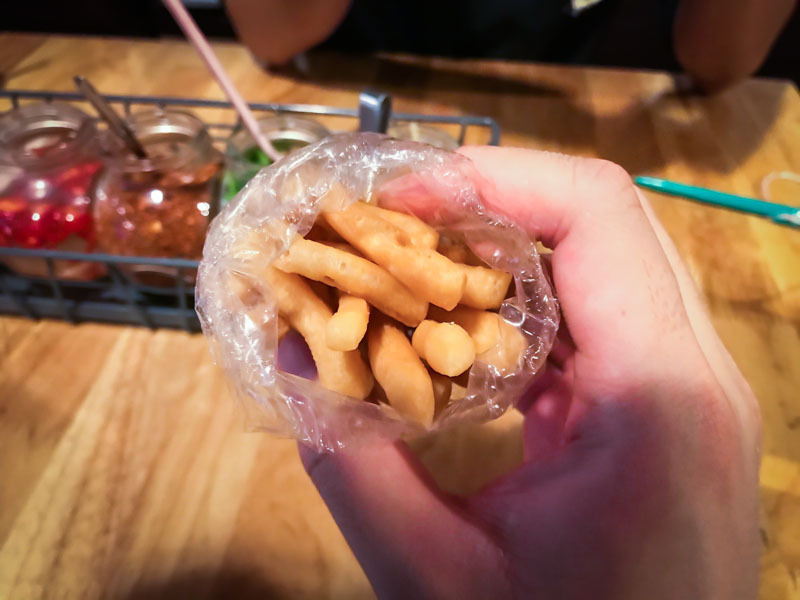 Pa Tong Go is a fried snack that resembles the Chinese You Tiao, but smaller and crispier. This goes extremely well with the porridge as a topping and you will get the added crunch with the gooey porridge. Pa Tong Go is served at THB 10 (approx. S$0.40) for a small packet here. The first porridge we tried was the signature Tom Yum Porridge. We ordered this with mixed pork (THB 69, approx. S$2.90). It was slightly surprising how the combination of thick plain porridge complimented so well with tom yum soup. The two mix together to give an extremely tasty and flavourful porridge. The fragrance of the tom yum herbs like lemongrass and lime leaves really provided a whole new porridge experience! The minced pork balls soaked up the tom yum flavours too and were our favourite ingredient. We also tried the Tom Yum Porridge With Seafood (THB 79, approx. S$3.30). Needless to say, seafood will naturally go well with tom yum flavours. The prawns were large and had a good bite to it, the squid was not too chewy and the mussels tasted fresh too. The last porridge we tried was the plain porridge with mixed eggs. Here, the plain porridge is served with a normal egg, salted eggs and century eggs. As compared to the Tom Yum Porridge, this version tasted blander, so I suggest starting the meal with this first. Yet, as a plain porridge, it still packs plenty of flavours. We could taste the broth that was used to cook the porridge, and it tasted even better after we added some spring onions and shredded ginger. The shop that we visited was at Talad Phlu and just a few hundred meters from the Talad Phlu BTS station. Having eaten here several times, we noticed that the cooking standards may not be consistent — there was once when the porridge was not prepared well and the ingredients were not cooked thoroughly. We recommend that you remind the staff to ensure that your porridge orders are served boiling and steaming hot for the best experience!